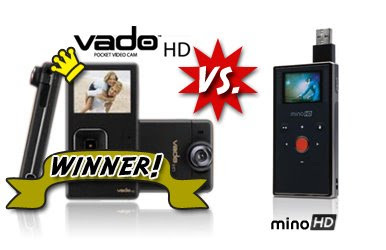 As we get more information on the Vado HD, it seems clearer to us that the new pocket video cam from Creative is a winner (at least against its long time archrival, the Flip Mino HD). Remember the protuding lens that we mentioned in our last post? That appears to be Wide Angle Lens! This means that we now have a wider field of view, which allow us to capture more on our videos. Although the Mino HD captures videos in HD, it can't output HD to TV as it uses the low-res NTSC cable for TV-OUT. The Vado HD on the other hand has HDMI output to HDTV 1080i! If you are not yet convinced to buy the Vado HD, how about this: although the Vado HD cost cheaper than the Mino HD (this is base on the conversion of it's Singapore selling price to US dollars), it has DOUBLE (8GB) the capacity. At 8GB, you can easily record up to 2 hours of HD recordings. While the Mino HD removed its previously popular Movie Mix in-built software (to allow you to make professional-looking home videos), Creative decided to throw in its own built-in movie making software with the Vado HD. We're inching towards the official release of the Vado HD, which would be a perfect gift for your loved ones this christmas. We will have more exclusives for you, do check back on us! Okay - enough already. Tell us all the specs, how much and when it will be released around the world. I want a Flip HD but will hang on a few more days to see if this is as good as it sounds. Xmas is coming - we need to buy our gifts now, don't be too late releasing it!!! I heard its going to be $399 and won't be available anywhere in the US until after Christmas. Until it's released it loses to the Flip HD. They are in the marketplace...the Vado HD is a dream. Don't wait get what's out. Until they commit to a release date...don't even think of the Vado. Who posted this originally saying it was cheaper than MinoHD and will be released before Christmas? Does this person work for Creative? Or FOS? Anonymous 2: USD$399 ah? Aiyoh, how like that, lose to Mino HD already, after Chirstmas somemore? So when exactly? Next Christmas? Or after the whole financial meltdown? Anonymous 3: It's okay lah, Sim say must believe in the impossible. So even if they delay the release, we still must belive that they will release it soon. It is cheaper than the Flip Mino HD, if you convert the Singapore Price to US Dollar ("...will retail at SGD$299 which if we convert directly to US dollar would be $196.") and no one said it will be released b4 christmas what? It's just "Coming Soon". okay? Strangely, multiple comments on the Vado HD comes from the same ip address but nevertheless, it says the same thing: Vado HD more ex than Mino HD, won't be out in US before Xmas. Maybe you might simply want to email me at kingone@gmail.com to save yourself (and myself)the trouble? And pls try to leave a username while leaving a comment so that it's easier for me to reply to you all. Thanks! kigone, the original post said, "We're inching towards the official release of the Vado HD, which would be a perfect gift for your loved ones this christmas ". Oh.... the Vado HD has HDMI output... now I'm interested. too late, bought two mino hd 's today as holiday gifts. so when exactly is this coming out? When are they coming to sweden!!?? ...i need one asap! Since this blog entry is a versus comparison, I'm a little surprised it left out the most important -- size and weight. Let's face it -- these devices are almost totally about size and weight versus performance ratio. If you wanted better quality/more features you'd just spend a little more and get something -- except you could no longer just tuck it into a shirt pocket. So here even tiny differences matter -- and I do believe there is a definite advantage in this regard for the Flip. Likewise, I don't see how a wide angle lens or HDMI is all that big a deal -- most folks *aren't* going to be watching vids shot with these cameras on their TV and in shooting video or stills the most important thing is getting as close as you can, imagewise, to your subject. I actually see the wideangle as a negative, personally. Still, I'd love to actually see a web site do a hands on comparison review between these two devices. It ain't gonna happen on such fansites as this, but I think we would all be well served by such an honest appraisal. It's pretty obvious there is a tremendous pent up demand for such a tiny portable HD video device (I suspect Flip will move a TON of units in the next two weeks).